The Audio/Video Setup lets you set audio preferences such as output, speaker configuration, and subwoofer control and adjust the video settings. 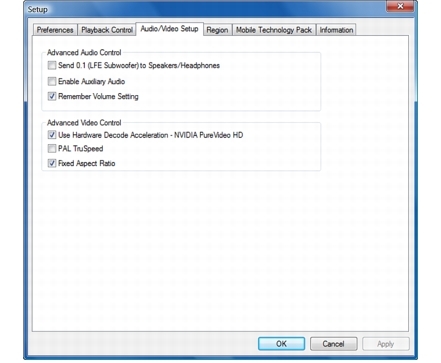 1 On the Setup dialog box, click the Audio/Video Setup tab. · Select Send 0.1 (LFE Subwoofer) to Speakers/Headphones to send the subwoofer signal to the main speakers or headphones. · Select Enable Auxiliary Audio option to enable auxiliary devices present in your system. The output of auxiliary audio devices is mixed with your MIDI and waveform-audio output devices. Select Remember Volume Setting to retain the last volume level setting the next time you run WinDVD. · Select Use Hardware Decode Acceleration to show the corresponding video technology (NVIDIA PureVideo HD, AMD Radeon, or Intel Clear Video). · Select PAL TruSpeed to automatically correct PAL speed errors and adjust audio pitch. Select Fixed Aspect Ratio to fix the aspect ratio of your video.